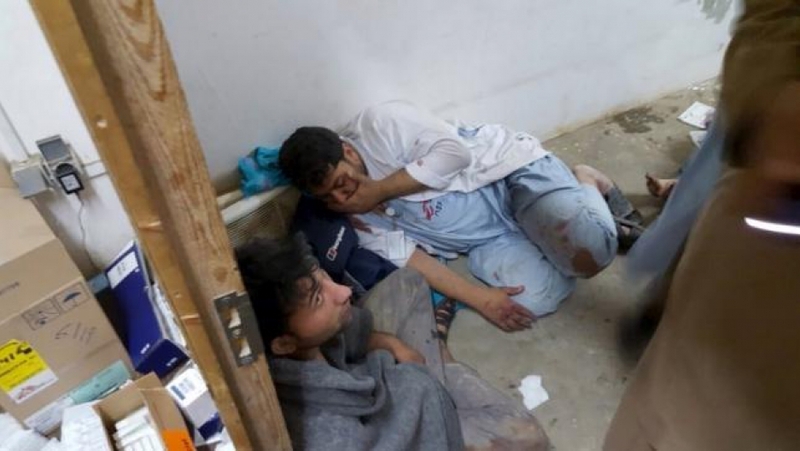 Doctors react in an Afghan hospital hit by an airstrike Saturday in Kunduz, Afghanistan. Doctors Without Borders is calling the incident a crime against humanity. Though the aid group repeatedly said that there had been no fighting around the hospital, the building was hit over and over again, despite the fact that Doctors Without Borders sent the US military the precise GPS coordinates so the hospital could be avoided. “When the bombing started, we were indeed in contact with military representatives in both Kabul and in Washington, but the bombing continued for another half hour to 40 minutes after those initial calls were made,” says Hawkins. The hospital is the only facility of its kind in the northeast region of Afghanistan, and Hawkins says the compound where it sits was “precisely targeted,” adding that the intensive care unit and the emergency room were hit the worst. For four years, Doctors Without Borders has been using this facility to provide free high level trauma care to civilians in the area. According to Doctors Without Borders, more than 22,000 patients received care at the hospital in 2014, and more than 5,900 surgeries were performed during the same time period. When the hospital was hit, medical workers were in midsts of caring for patients. The group is now planning to leave the area, something that could be devastating to civilians in the area — Hawkins describes the trauma center as a “vital lifeline” for the community.